（英文）Rohlfs, K., & Wilson, T. L. (2004). Tools of radio astronomy. Astronomy and astrophysics library. Berlin: Springer. ^ Marr, Jonathan M.; Snell, Ronald L.; Kurtz, Stanley E. Fundamentals of Radio Astronomy: Observational Methods. CRC Press. 2015: 21–24. ISBN 1498770193. ^ Britannica Concise Encyclopedia. Encyclopaedia Britannica, Inc. 2008: 1583. ISBN 1593394926. ^ Verschuur, Gerrit. 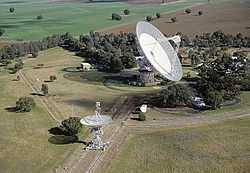 The Invisible Universe: The Story of Radio Astronomy 2. Springer Science & Business Media. 2007: 8–10. ISBN 0387683607. ^ Introduction to the EVN. [2014-02-03]. ^ 中研院天文-格陵蘭望遠鏡與次毫米波特長基線干涉儀計畫. www.asiaa.sinica.edu.tw. [2018-03-01] （中文（台灣）‎）.